66 GO TO 77 ; . . . IF (E) THEN ; . . .
と assigned GO TO statement 100 . . .
DATA A, B, C / 5.0, 12.0. 13.0 / . . .
固定フォームソースコード * Column 1 contains * or ! or C for comments. C Column 6 for continuation. 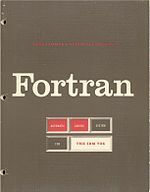 Valmer Norrod, et al:"A self-study course in FORTRAN programing - Volume I - textbook", Computer Science Corporation El Segundo, California, (April,1970). NASA(N70-25287). Valmer Norrod, Sheldom Blecher, and Martha Horton: "A self-study course in FORTRAN programing - Volume II - workbook", NASA CR-1478, Vol.II (April,1970), NASA(N70-25288).